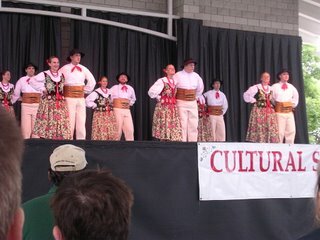 From June 23 – June 25, 2006, members of the Wawel Folk Ensemble participated in Milwaukee, WI’s Twenty-Fifth Annual Polish Fest. On Saturday, June 24, Wawel performed on Polish Fest’s cultural stage in a long program with the Wici Dancers from Chicago, IL. Wawel presented its Opoczno, Nowy Sacz and Zywiec suites. Zywiec is Wawel’s newest suite and made its debut at Wawel’s 40th Anniversary Concert in December 2005. Wawel performed its Zywiec suite for only the third and fourth times in Milwaukee. Additionally, these were Wawel’s first exhibitions of the Opoczno and Nowy Sacz suites at Polish Fest. Later that afternoon, Wawel presented its Zywiec suite again as part of the Polish Folk Dance Association of the America’s (PFDAA) gala performance on Polish Fest’s cultural stage. Also appearing in the PFDAA gala was the Syrena Folk Ensemble, the Krakowiak Dancers, and the Polish Falcons from Milwaukee, WI, Wesoly Lud, Lajkonik, Lehichi, and Wici from Chicago, IL and Dolina from Minneapolis/ St. Paul MN. The Polish Fest performances marked new Wawel member, Alicja's debut. Congratulations! On Sunday, June 25, Wawel participated in the procession at the annual Polish Fest mass before the festival opened. While at Polish Fest, members of Wawel also took in the sounds of many of the US’s top polka bands as well as sampled some favorite Polish Delicacies. Wawel is now in the midst of its summer festival appearances. On June 28, Wawel appeared with Big Daddy Lackowski at Birmingham’s Polish Wedding in the Park. Wawel will appear at many parish festivals over the next several weeks, at Freedom Hill’s Polish Festival and in the Hamtramck Labor Day Parade. The Ensemble is also busily learning new suites of dances to include in its repertoire for upcoming performances. On Friday June 9, 2006, the Wawel Folk Ensemble performed at the International Institute's, All World Market held in Mid-Town, Detroit. The All World Market is held in conjunction with the annual Detroit Festival of the Arts held on Wayne State University's campus. Wawel has participated in this event for many years, and is looked forward to by the Ensemble. Wawel presented the Polonez, its Lowicz and Rzeszow suites and the Karolina Polka. In addition to Wawel's performance, the market featured song and dance presentation from numerous other countries, food and vendor's selling items from around the world. To complete the all world feeling for the evening, members of the Ensemble headed to Detroit's Greektown for dinner immediately following the performance. The Ensemble's next performance will be at Wisconsin's annual Polish Fest (www.polishfest.org). The Ensemble is currently practicing twice a week in preparation.